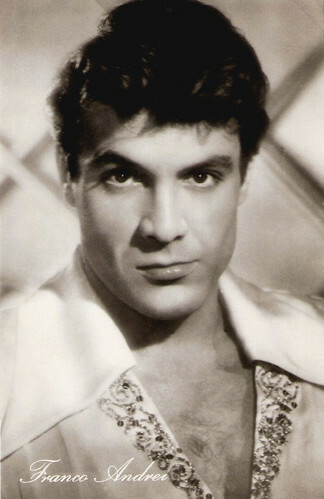 Italian actor Franco Andrei (1925) played the hunky Latin lover in German and Italian comedies of the 1950s. 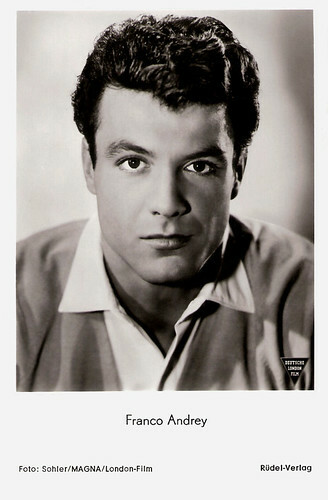 In the 1960s, he appeared as a secret agent in several Eurospy-films and in the TV series Mission: Impossible. East-German postcard by VEB Progress Film-Vertrieb, no. 440, 1957. Retail price: 0,20 DM. Photo: Standard-Film. German postcard by Universum-Film AG (UFA/Film-Foto), Berlin-Tempelhof, no. FK 1459. Photo: Arthur Grimm / CCC-Film / Allianz Film. Publicity still for Stern von Rio/Star from Rio (Kurt Neumann, 1955). East-German postcard by VEB Progress Film-Vertrieb, Berlin, no. 222, 1957. Photo: Standard-film, Wien. 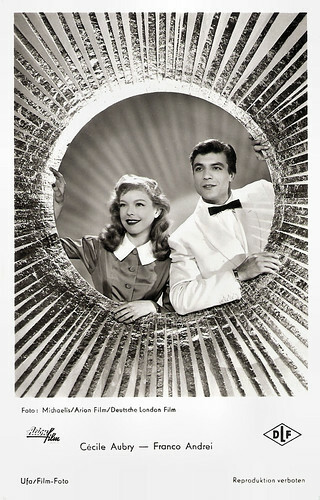 Publicity still for Drei vom Variété/Three from Variety (Kurt Neumann, 1954) with Erich Schellow and Ingrid Andree. Franco Andrei was born in Italy in 1925. 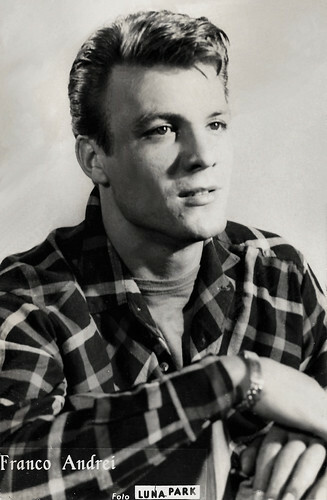 He made his film debut in the early 1950s. In 1953, he appeared as the Italian lover of Maria Schell in the German comedy Tagebuch einer Verliebten/The Diary of a Married Woman (Josef von Báky, 1053) with O.W. Fischer as her husband. The film was based on one of the popular novels by Johannes Mario Simmel. 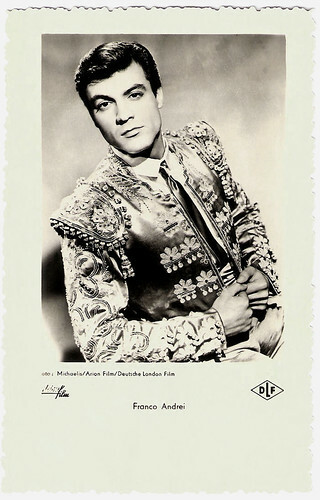 Andrei played another Latin lover – this time a Spanish one - in the musical Tanz in der Sonne/Dance in the Sun (Géza von Cziffra, 1954) with French actress Cécile Aubry. 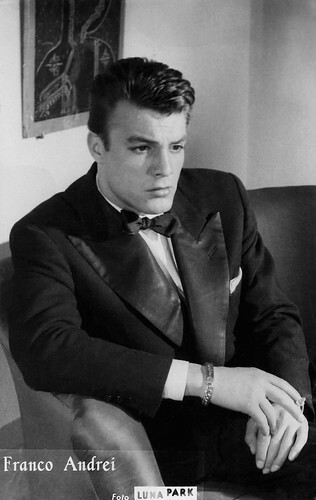 He also appeared in the German crime drama Drei vom Varieté/Three from Variety (Kurt Neumann, 1954) with Ingrid Andree, and the German-Italian adventure film Stern von Rio/Star from Rio (Kurt Neumann, 1955) with Johannes Heesters. 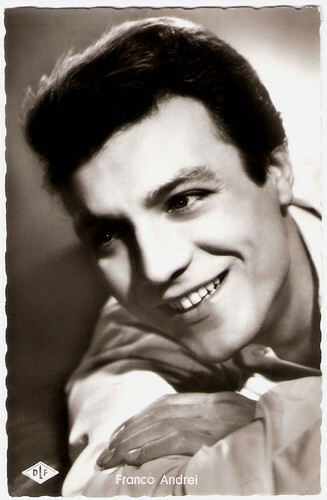 Andrei also appeared in Italian films, including the romantic adventure film La capinera del mulino/The Blackhead of the Mill (Angio Zane, 1956) with Marisa Belli, the melodrama Suprema confessione/Supreme Confession (Sergio Corbucci, 1957) starring Anna Maria Ferrero, and the musical Come te movi, te fulmino!/Move and I'll Shoot (Mario Mattoli, 1958) with Giovanna Ralli. 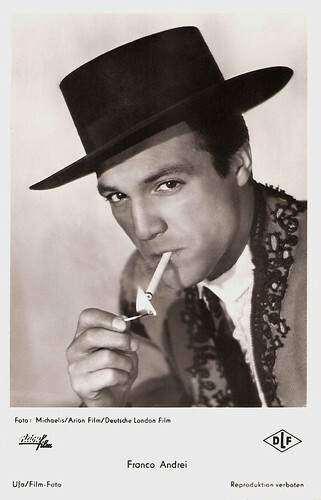 He also played a supporting part in the French film Sait-on jamais.../No Sun in Venice (Roger Vadim, 1957) about a cute and amoral (and Vadim’s favourite type of) French girl (Francoise Arnoul) living in a sumptuous Venetian palazzo. Andrei was one of the handsome guys swarming around her. Italian postcard by Farrania. Photo: Luna Park. German postcard by Kunst und Bild, Berlin, no. A 1122. 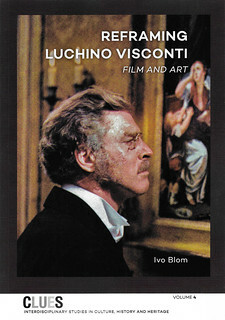 Photo: Deutsche London Film. German postcard by Rüdel-Verlag, Hamburg-Bergedorf, no. 859. Photo: Sohler / MAGNA / London-Film. Publicity still for Tagebuch einer Verliebten/The Diary of a Married Woman (Josef von Báky, 1953). German postcard by Kolibri-Verlag, no. I 103. Photo: Sohler / Magna / London-Film. Publicity still for Tagebuch einer Verliebten/The Diary of a Married Woman (Josef von Báky, 1953) with Maria Schell. 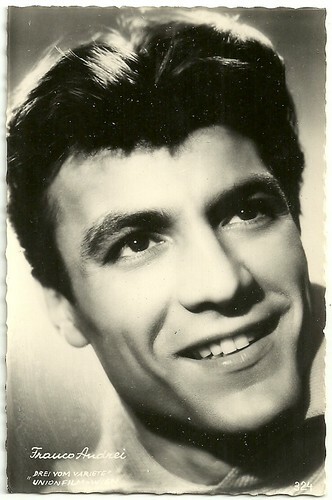 Franco Andrei continued his international film career in the 1960s, although his appearances became rarer. He was again the stereotypical Latin lover in the romantic comedy Schick deine Frau nicht nach Italien/Do Not Send Your Wife to Italy (Hans Grimm, 1960) starring Marianne Hold and Claus Biederstaedt. He had a supporting part in the American production The Big Show (James B. Clark, 1961), which was filmed on location in Munich, Germany. 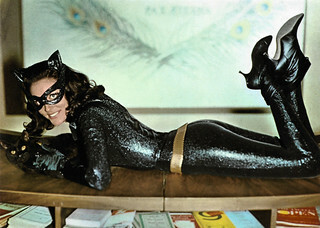 The film’s main claim to fame was that it was the last major production starring aqua diva Esther Williams. As Frank Andrews, Andrei played a secondary character in the Eurospy film Agente 3S3: Passaporto per l'inferno/Agent 3S3: Passport to Hell (Sergio Sollima, 1965). (The meaning of the codename Agent 3S3 is Secret Agent No. 3 of the 3rd Special Division). He returned in another Eurospy thriller by director Sollima, Requiem per un agente segreto/Requiem for a Secret Agent (Sergio Sollima, 1966) starring Stewart Granger. Robert Firsching at AllMovie adds: “This classic blend of science-fiction and horror belies its extremely low budget with buckets of atmosphere and some genuinely creepy setpieces. The story concerns the crews of two spaceships, who land on a foggy, seemingly deserted planet. What they don't know is that the planet was home to a race of vampiric aliens, who possess their minds, eventually rising from their strange, misty graves to seek human blood. Legendary director Mario Bava once again proves himself a master at atmospheric composition, using color, sound, and minimalistic sets in original and unnerving ways. 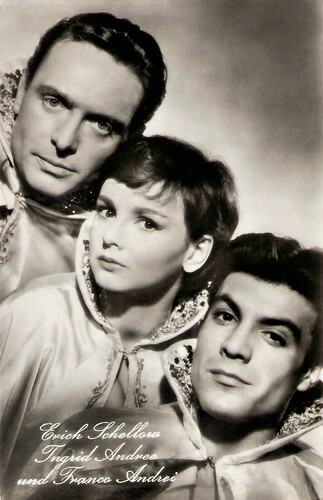 Barry Sullivan stars”. 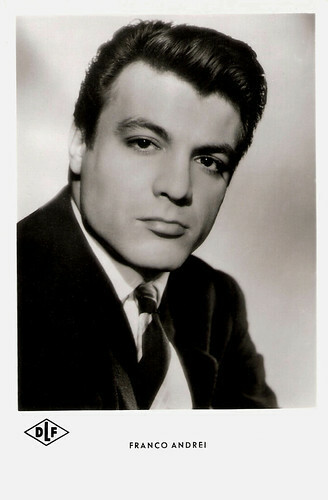 On American TV, Franco Andrei could be seen in a guest role in the popular series Mission: Impossible (1967). After the crime film Supercolpo da 7 miliardi/The 1000 Carat Diamond (Bitto Albertini, 1967) with Brad Harris, Franco Andrei’s film career virtually ended. More than 20 years later followed his last screen credit for the German TV drama Der lange Sommer/The Long Summer (Jochen Richter, 1989). German postcard by Kolibri-Verlag, Minden-Westf., no. 1112. Photo: Standard-film / Deutsche London / Lilo. Austrian postcard by HDH Verlag (Verlag Hubmann), Vienna, no. 324. Photo: Union Film. 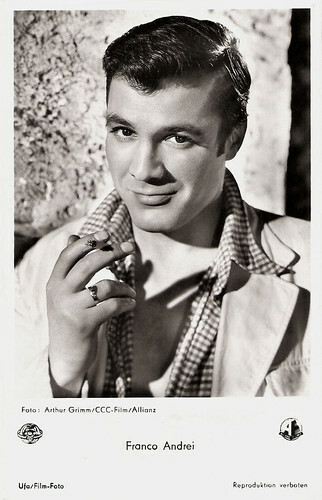 Franco Andrei in Drei vom Variété/Three from Variety (Kurt Neumann, 1954). German card. Photo: Michaelis / Arion Film / Deutsche London Film. Publicity still for Tanz in der Sonne/Dancing in the sun (Géza von Cziffra, 1954). German postcard by Ufa, Berlin-Tempelhof, no. FK 1145. Photo: Michaelis / Arion Film / Deutsche London Film. 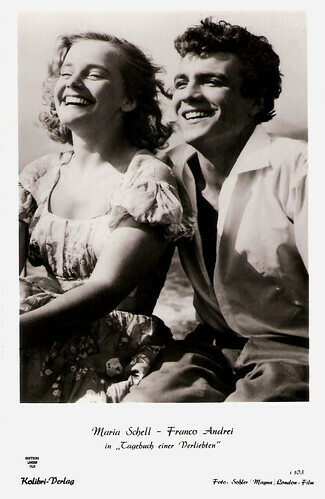 Publicity still for Tanz in der Sonne/Dance in the Sun (Géza von Cziffra, 1954) with Cécile Aubry. 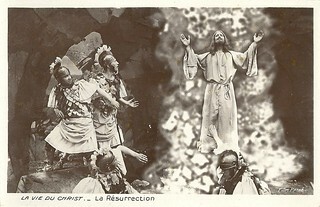 German postcard, offered by Cinema Capitole, Luxenbourg. 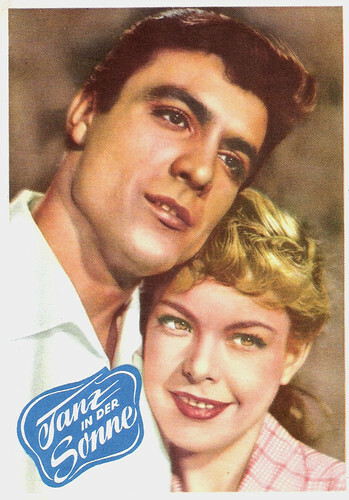 Publicity still for Tanz in der Sonne/Dance in the Sun (Géza von Cziffra, 1954) with Cécile Aubry. Sources: Hal Erickson (AllMovie), Robert Firsching (AllMovie), MYmovies.it (Italian), and IMDb.